The church is dedicated to St Nicholas, the patron saint of fishermen and children. The earliest surviving feature is the round tower, which dates from the 12th century and has a 14th-century octagonal extension, one of the best preserved in the country. It is famed for its hammerbeam roof and the unique 15th-century brick font. The church also contains a scheme of wall paintings dating from the 14th century, the most readable of which depicts the Seven Works of Mercy. St Nicholas is set away from all the tourist madness on the edge of the village overlooking the fields. 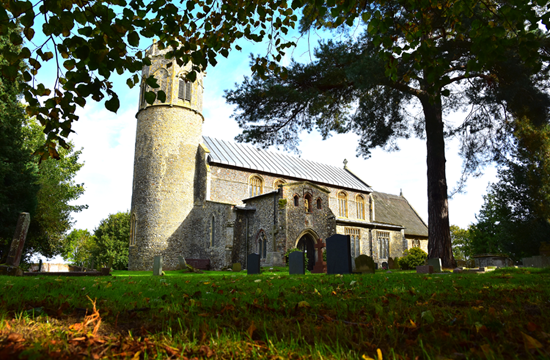 It is one of the most attractive churches in the county, with its tall clerestory and the more rustic chancel with thatched roof huddled at the east end. The bell stage to the round tower is later than most, and is elegantly decorated with flushwork and crowned with battlements. The overwhelming effect is of the late Middle Ages.Brick was used to good effect to pick out the clerestory windows and the niches on the otherwise rather stark porch. In the central niche is the figure of a woodwose. St Nicholas in Potter Heigham has a Sunday service at 10.00am. This may be a service of Holy Communion or Morning Worship, please check the calendar for more details.